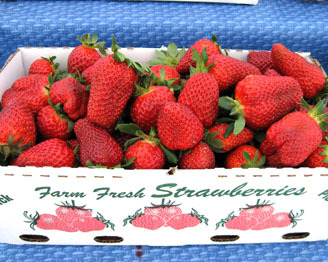 Strawberries are just coming into season in Lancaster County, so it’s the perfect time of year for the Historic Smithton Inn’s Strawberry Amaretto Stuffed French Toast recipe. But if you can’t come to us (bummer! ), here’s the recipe so you can whip it up for youself at home! In a large saute pan over medium heat, combine strawberries, sugar and 2 tbsp amaretto. Stir gently until cooked, but still firm. Set aside to cool. In a large bowl, combine mild, eggs, 1/8 cup amaretto and agave. Blend with hand-mixer. Prepare the bread by first cutting off the heal. Then make 1/2 inch cuts with a bread knife, first 3/4 through the loaf, then all the way through. Continue until both baguettes are sliced. Spread about 1 tbsp ricotta cheese into fold in bread. Top with about 2 tbsp strawberries. Place stuffed bread in baking dish. Continue with remaining bread, using as many baking dishes as needed for a single layer of stuffed french toast. Pour custard evenly over bread, making sure that the top and bottom halves are saturated, but not overly so. Pour out any excess custard from baking dish. French toast slices can be individually frozen at this point. Pre-Heat up a griddle to 300F. Spray with non-stick spray. Cook stuffed french toast for 8 minutes a side, or until cooked through and outside is toasted light brown. Serve with fresh strawberries and a dusting of powdered sugar on top and a side of whipped cream.